An Employment Verification Check is particularly relevant where experience is essential for consideration. Previous employment experience is often overstated, and sometimes purely fictitious. As a result, you’ll want to verify prior employment. Verification is available for previous positions held, starting and ending dates of employment, eligibility for rehire and other relevant information about the applicant’s performance. Report turnaround times average 2-3 days. 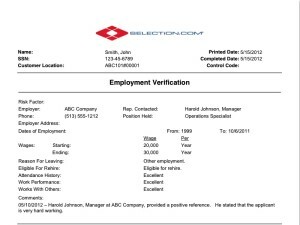 Employment verification is performed by experienced SELECTiON.COM® staff members. The following information is required to verify employment: applicant’s name, applicant’s phone number, employer’s name, employer’s phone number, city, state, and position held. Other requested information includes: dates of employment, job title, last supervisor and Social Security Number. The following information will be returned, whenever possible: quality of work, how well the applicant worked with others, attendance history, motivation, work habits, reason for leaving, and starting and ending salary. Information that could not be obtained will be listed as “Not Disclosed” on your final report. A comment field is also used when applicable. A detailed Log File is maintained and is accessible via Fastrax Select® to follow the progress of all employment verifications. Click here for an employment verification sample background check. Click here for a full description of the employment verification background check.